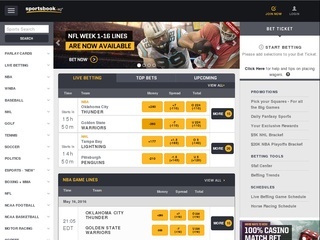 Sportsbook.com is an established gambling company with years of experience in the branch. Since the early 1996 the online bookie is operational and it was among the first to provide sports betting services over the internet. Nowadays this privately held company is serving numerous clients throughout the USA under the jurisdiction of Antigua. In the past, Sportsbook.com has a very controversial history. Just five years after its foundation, the bookie was accused of illegal activities, but the case was never brought to court. Sportsbook.com has also been named “Best US Sportsbook” for two years in a row – 2005 and 2006. The online gambling firm also managed to rise through the ranks and become one of the largest sports betting providers on American soil. However, with the UIGEA 2006 the company behind Sportsbook.com (Sportingbet) decided to transfer almost all their US assets to a brand new company called Jazette Enterprises Ltd. To escape the harsh federal law system and any criminal prosecution by the US government, Sportingbet sealed a deal, and the online sports betting platform was sold for 1$. In 2011, Sportsbook.com also changed its name to Sportsbook.ag and further increased its base of operations to many other countries around the world. Sportsbook.ag, as we are going to call it from now on, offers a wide variety of sports betting markets and other exciting gambling services for all their clients. This giant gambling provider is surely one of the best choices as it offers a perfectly designed interface and user experience on their platform. The offered sports are about 10 with the most famous leagues included. Wagers are accepted for Olympics, Fantasy Sports and Politics as well. When it comes to features, Sportsbook.ag supports live betting, and their website is fully responsive for mobile users. Apart from sports, the company offers plenty of casino games for all enthusiasts. Some of the most popular are Blackjack, American Roulette, Deuces Wild, Jacks or Better, Craps, Keno and Three Card Poker. 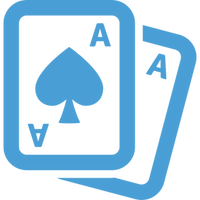 There are separate poker rooms as well, where players can test their skills against others. Talking about odds, the overall impression of Sportsbook.ag’s offering is very good. Recreational bettors can take advantage of some excellent odds on the underdog lines. The odds are formatted according to the American convention and updated regularly. There is no minimum bet set for now, but the limits are quite colourful. Overnight lines and non-American markets employ limit of $500 to $1000 for both smaller and larger offerings, and they turned to be some of the lowest. Usually, most of the sports’ limits are set to $5000. However, the NFL betting opportunities can go up to $11 000 for some events. When it comes to football betting, Sportsbook.ag is not one of the best online bookmakers. As American sports betting provider, it’s natural that they have their services more focused on the US sports. There are great football betting options. However, they are quite limited compared to other. Football betting enthusiasts can enjoy 1X2, 1st Half, 2nd Half, Draw No Bet, Total Team Goals, Both Teams to Score, Shutout, Goalscorer, Match Stats, Yellow Cards, Corners, Correct Score, Half-time/Full-time, Exact Total Goals and 1st Team to Score. All these betting schemes can be wagered as a Straight bet, Parlay or IF bets. Like many other reputable bookmakers, Sportsbook.ag is having a strong and reliable security. The online bookie employs efficient SSL encryption on its website verified by GlobalSign. The level of encryption is very good as it uses CA-SHA256-G2 standard. On top of this excellent protection, Sportsbook.ag uses an enhanced firewall protection on their servers, which ensures that all private data is well secured. 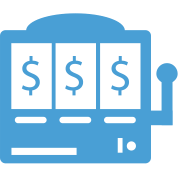 The customer services of the online bookie are operational 24/7 and ready to assist any customer with any part of the world. According to many US clients, the support is highly responsive and professional. They can be reached out via phone, email or live chatting system. Various languages are supported on all contact methods. As a large online sports betting provider, Sportsbook.ag supports a wide range of payment option and probably the richest collection of card payment methods. You can easily review them all in the following table. Customers from the US will be happy to learn that all deposit and withdrawals are free from any additional charges. However, the online bookie is very responsible when it comes to verifications. Before any withdraws the client must prove his identity with some documents. All deposits are usually processed very fast, except for the slow options such as the bank transaction. Withdraws can be delay by the security checks, which apply to every single customer. There are tons of promotions that you can find in Sportsbook.ag. Newly registered players can benefit from $50 Match Bet in the Instant Casino platform. The customer is free to wager the amount on more than 80 different casino games. Mobile users can take advantage of the 25$ Mobile Match Bet when they log in mobile.sportsbook.ag for the first time. 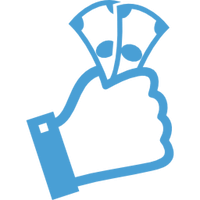 Your account will be instantly funded with the amount. Existing players can refer a friend for additional cash in their accounts. When your recommendation registers with a new account and makes its first deposit, you can get up to 25% of the amount in the form of Free Bet. Loyalty programs are absent at this time, but there are many other seasonal hot deals and bonuses on particular events and sports.